I always love giving tours to prospective Inly families and seeing Inly anew through their eyes. And, it is equally rewarding to hear the words of appreciation from our current Inly families who have returned to campus this fall. These moments remind me of my first visit to a Montessori school while living in Chile, where I, too, was struck by the beauty of the classrooms. I was pulled in immediately–as were my children–and our family spent two formative years as members of that Montessori community. It wasn’t until we found Inly School some years later that we were able to recapture those feelings of being enveloped and at home in a beautifully prepared learning space. It was comforting to be back in a Montessori environment. Even though we were halfway across the world, the materials were the same, the furniture was the right size for my children again, and there was a sense of order and calm in each room. It wasn’t until I became a Montessori educator myself that I learned about the purposeful choices that each Montessori teacher makes as he or she sets up a classroom. Dr. Maria Montessori had a deep conviction that “the child should live in an environment of beauty,” and that “the things he sees are not just remembered; they form a part of his soul.” She instructed that classrooms be “scientifically planned and methodically formed,” and articulated principles that must be considered in each Montessori environment: structure and order, reality and nature, beauty and simplicity. That is why you will see natural wood, natural lighting, well organized materials that follow a logical progression, uncluttered shelves with beautiful and inviting manipulatives, soothing colors, and comfortable furniture in a Montessori classroom. These types of environments are intended to calm students, to ground them in nature, and to entice them to explore. They are also arranged to maximize the child’s independence, concentration, and growing sense of responsibility. From Toddler House to Middle School, students at Inly are taught to care for their environment. Children as young as 18 months are taught to treat the materials with respect, to take only one work out at a time, and to put work away when they are finished. In the early grades, each classroom has a “practical life” section where children learn how to care for themselves and for their environment. Children are taught how to do important everyday tasks such as buttoning, zipping, sweeping, pouring, flower arranging, sewing, and washing a table. Through the practical life activities in the Montessori classroom, a child not only learns concentration, coordination, independence, and order, but also how to interact with others and gain an understanding and appreciation of the environment. The child begins to build himself from within while learning to treat himself and others with respect and dignity. That is why you will see the teachers at each level take the time to engage students in daily jobs within their classrooms, and, as they grow, within their broader school community. As you return to Inly this fall and visit the classrooms, I encourage you to take note of the essential components of a Montessori classroom. Notice the commonalities from room to room, space to space. 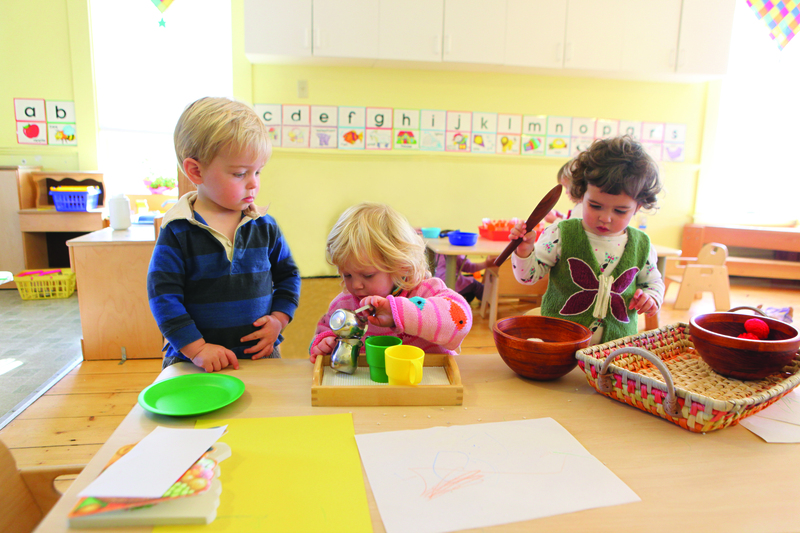 The classrooms, outdoor playgrounds, Meehan Family Artsbarn and the rest of the campus were all purposefully designed with Montessori’s philosophies in mind. And while each space is unique, they are all intended to nurture joyful discovery, the growth of personal responsibility, and a deep connection to self and community.